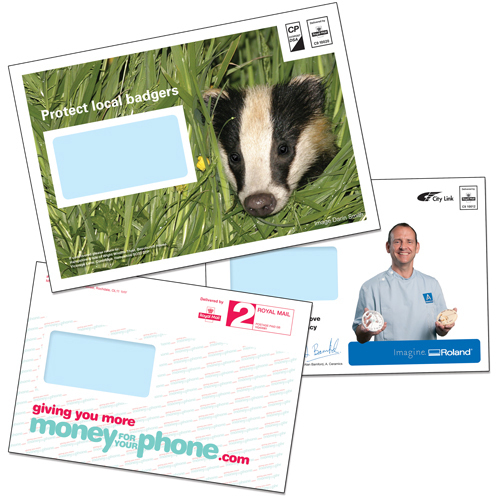 We can now print envelopes with either just a single colour or FULL Colour and there is no minimum quantity – this new technology we have introduced even allows us to print variable text in colour at the same time, or even a different image with variable text as well – if you need to know more then please call the team. We offer a high-quality envelope overprinting service on a variety of envelope sizes. Whether you want single colour business reply envelopes or a complex 4 colour company logo and slogan to give your mailing more impact – Mail and Print can help. Did you know we can do edge to edge printing on over printing envelopes, and printing both faces at the same time at very high speeds – need envelope in a hurry then give us a call and we would be pleased to help. We stock over 1 million envelopes from C6 to oversize C4, gussets, peel and seal, pockets, wallets and over 300 different types in the range, from plain to window, 90gsm to 160 gsm, from white, manilla and a vast range of coloured and padded envelopes. You can either supply the envelopes yourselves or we can supply them. We can print single or double sided, C6 to C4 and most other custom envelope sizes.